the nytpicker: The Times Wages A Hypocritical War Against Sarah Palin's Appearance. The Times Wages A Hypocritical War Against Sarah Palin's Appearance. Today the Times weighs in yet again on the "controversy" surrounding McCain campaign's spending on Sarah Palin's stylists -- this time with a story that suggests, with professed astonishment, that there's a link between politics and celebrity. The Times's coverage of this story reflects not only an offensive and sexist obsession with Palin's appearance, but also the paper's hypocritical harshness towards the former Republican vice-presidential candidate. Never, in the last two years, has the Times investigated campaign spending on the appearance of any other presidential candidate, male or female. By implication -- without any reporting to suggest otherwise -- the Times wants us to believe that Palin, alone among candidates for national office, used campaign funds to buy clothes and get makeup assistance from paid professionals. Is there anyone in America, besides the team of Times reporters assigned to the Palin non-story, who believes that Hillary Clinton didn't spend a comparable amount of money out of her campaign funds on her appearance? The only difference is that she campaigned for two years, not nine weeks. And in the post-Nixon era, does anyone seriously think that John McCain and Barack Obama had no professional help with their hair, clothes or makeup? So shoot me: at the end of the day (and the beginning, if it comes to that), in the high-definition show business of politics — as in everything else — looks matter. Appearance, whether we like it or not, has become the coin of the realm, the locus of our conversation: in our image-saturated, relentlessly scrutinizing Visual Age, we trade in it, subliminally or overtly, whether we are talking of Victoria Beckham or Hillary Clinton. If appearance has become the coin of the realm, than how can politicians be expected to avoid dropping a few coins on stylists and hairdressers? Merkin, Maureen Dowd and others have written extensively on Hillary Clinton's appearance; the media's mentions of her pantsuits became so ubiquitous that Clinton herself made it a part of her comic patter. But who paid for those pantsuits? Or Michelle Obama's dresses that prompted so much commentary? Has any reporter gone through the Democrats' filings to check whether any of Obama's $750 million war chest went towards the same sort of expenses Palin incurred? Senator John McCain’s presidential campaign spent more than $165,000 over the course of nine weeks on a trio of stylists for Gov. Sarah Palin of Alaska, equivalent to what a Hollywood studio might invest in preparing an A-list actress for a movie premiere or publicity campaign, other stylists said. In the lede, the notion of Hollywood-style spending is presented as nothing less than sinful. The Times now appears to find it a moral and ethical outrage that Palin's handlers saw her appearance to be an legitimate element of the political process. The 1,266-word story then goes on to assess the costs of Palin's beauty care by interviewing Hollywood stylists, dropping names like Jennifer Lopez and Reese Witherspoon into the mix. It vacillates on the question of whether the charges were excessive -- some say yes, some say no, all say it depends on the circumstances. The filings furnished a trickle of new details to what has become one of the lingering controversies of the 2008 presidential campaign: the expensive makeover of Ms. Palin, the vice-presidential nominee, for the campaign, including the tens of thousands of dollars spent by the Republican Party on clothing for her and her family, undermining her calibrated “hockey mom” appeal. Meghan Stapleton, a senior adviser to the vice-presidential campaign, said Friday that Ms. Palin had not been consulted about the expenditures. “The decisions reflected in this disclosure are financially poor decisions made by campaign staffers hired by the campaign and not the governor,” Ms. Stapleton said in an e-mail statement. But for once, Palin is missing an appropriate moment to attack the media for its wrongful obsessions. Not only did she do nothing wrong, neither did the McCain campaign in spending money on her appearance. The failure here belongs to the Times for applying a double standard to Palin. Politicians entitled to the same style care as celebrities, and Palin ought to be entitled to the same freedom from scrutiny that her fellow politicians enjoy. 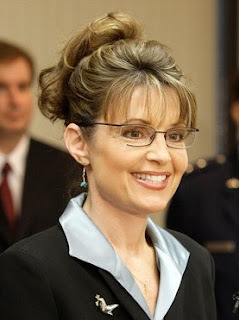 While Luo and Horyn spend their days poring over Republican campaign records for more evidence of Palin's supposedly excessive concern with her looks -- with the blessing of their Palin-hating editors -- Hillary Clinton is laughing all the way to the hairdresser. Cathy Horyn has about as much concern for actuality as Judy Miller did. If it sounds good, write it. At least Horyn's normal beat is harmless drivel. Her qualifier for her top anti-Palin witnesses breaks new ground: "Two Hollywood stylists, each of whom works with leading actresses but asked not to be identified because of their clients’ wishes, said Ms. Kline’s fee seemed excessively high." Are readers supposed to believe that said stylists called their clients to ask permission to give an opinion about a totally unrelated customer? You betcha. But it sounds so good, so real. This whole issue has bothered me from the get-go. My response is a resounding "Who cares?" to the whole thing. Yes, people in the public eye spend money on their appearances. And as far as the "But she's a hockey mom!" drivel goes, well, yes, that might explain why she didn't have any expensive clothes in her existing wardrobe. I agree that if the story is going to be covered at all, then look at what all the candidates paid for similar expenses, then tell me if it is reasonable. I really don't care what Hollywood does, or thinks.